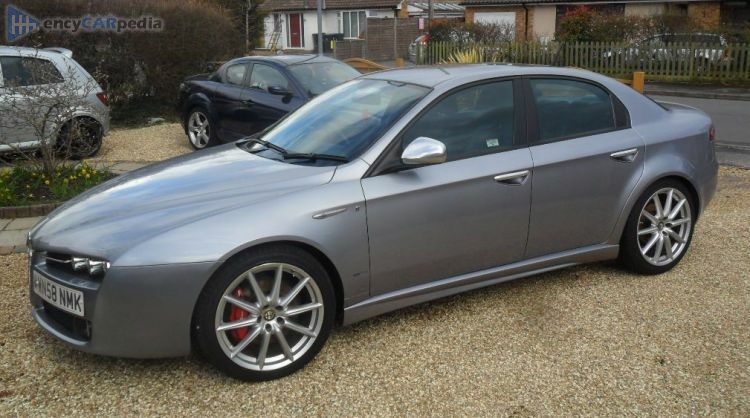 This Alfa Romeo 159 1.9 JTDM 8v was produced from 2008 to 2010. It's a facelift of the 2005 Alfa Romeo 159 1.9 JTDM 8v. It's a front-wheel drive front-engined medium saloon with 4 doors & 5 seats. With 118 hp, the turbocharged 1.9 Litre 8v Inline 4 diesel engine accelerates this 159 1.9 JTDM 8v to 62 mph in 10.7 seconds and on to a maximum speed of 120 mph. Having a kerb weight of 1555 kg, it achieves 47.9 mpg on average and can travel 737 miles before requiring a refill of its 70 litre capacity fuel tank. It comes with a 6 speed manual gearbox. Luggage space is 405 litres. Last updated on 22nd November, 2018.
encyCARpedia was created to be the go-to source for car specifications. It is not a wiki, so cannot be edited by the public. All car specifications are provided by the car manufacturers as well as selected enthusiast car club members and is checked and verified before being published. Thanks for using this site, I hope it was helpful.